Marcus Alonzo Hanna was an American capitalist and politician, b. New Lisbon (now Lisbon), Ohio. He attended Western Reserve College for a short time, then entered his father’s wholesale grocery and commission business at Cleveland in 1858. He became a partner in 1862 and rapidly developed as a characteristic American capitalist of the Gilded Age. Hanna became a dealer in coal and iron mines, furnaces, lake shipping and shipbuilding; his financial enterprises included ownership of a bank, a newspaper, an opera house, and a street-railway system. He was active in politics and by 1890 was the ruling power in the Ohio Republican party. He was instrumental in having William McKinley elected governor of Ohio in 1891 and again in 1893. 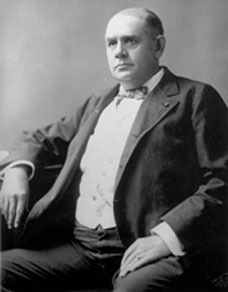 Hanna saved McKinley’s reputation when financial ruin threatened, groomed him for the presidency in 1895, and was responsible for his nomination by the Republicans in 1896. As chairman of the Republican National Committee, Hanna boldly made that campaign a defence of business and property against the doctrines of the Democrats enunciated by William Jennings Bryan; on that basis he received heavy financial contributions from big business. He was appointed Senator from Ohio in 1897 after John Sherman resigned and was subsequently elected to the seat. Hanna continued to dominate Republican party councils until he died. He supported ship subsidies and advocated construction of the Panama Canal, opposing the Nicaraguan route. At the time of his death Hanna was being considered as a possible presidential candidate by old guard Republicans disenchanted with Theodore Roosevelt’s progressive policies. Although sympathetic at times to organized labor, Hanna looked upon the great industrialists as the natural leaders of the country. His leadership of the party exemplified the union between business and politics for the purposes of economic policy rather than for personal graft.